Lords of Hell is a card game for 2-6 players. Gaming time is 15-90 minutes, depending on player count and used rules. These rules are for beginner game, with minimal rules. Rules for Alliances, Oaths, and Personal Decks are given later. They are recommended but it might be easier to start without them. 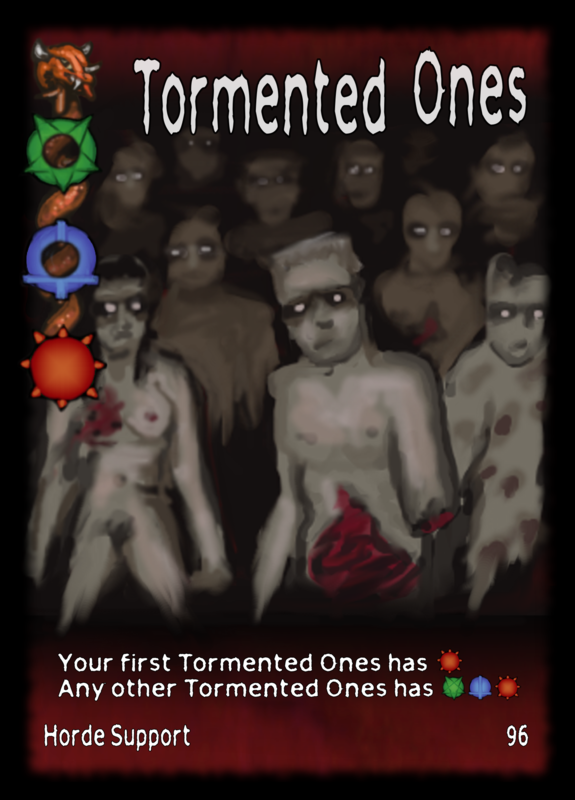 Resource card: cards that form the main deck, with total of 60 cards each with red back with Lords of Hell logo. There is two main types of resource cards: events and support cards. Events (marked with lightning) have some immediate effect while support cards (marked with column or similar symbol) stay on the table when tabled until explicitly discarded. Any discarded resource cards form the main deck discard pile, which is face-up next to the main deck. If cards are drawn from the main deck and it runs out, shuffle the discard pile to form a new main deck. Devil card: tells everybody else who is playing what Devil. Always face-up in the front of player. Each Devil has different power which affects gameplay. Home realm: each Devil controls one home realm which is always face-up at the front of the player. Each home realm has symbols (Military, Souls, and Politics) with number on them. These numbers are used to resolve ties in dominion supremacy and in some other situations. , the value in Politics, is also used to determine the initiative order, smallest going first. Each player gets a random home realm card and a Devil card, or whatever suits your gaming group. The players can then arrange to sit in the initiative order, but as this is subject to change, this is not encouraged. Remove non-used Devils from the game and put extra home realms to middle of the gaming board. Shuffle the resource cards and deal 3 horde cards to front of each Devil. Then shuffle the remaining cards to form the main deck. In the initiative order, each Devil draws 3 cards, but to minimum of 6 hand cards. Thus, if a Devil has 1 hand card at the start of the game turn, that Devil draws 5 cards. Any extra cards are added to this. Home realms can only be swapped one-to-one. Tabled cards stay on the table and hand cards stay in hand. Devils are free to make any promises on gameplay but can freely ignore such a promises. However, any immediate agreed trades must be kept. The trading is over when everyone is settled. The Devils can agree on timer, like one minute time limit as soon as a Devil requests for it. Each Devil, if able, tables 3 cards, but to minimum of 6 tabled cards, face-down. Thus a Devil with 2 tabled shown cards tables 4 cards face-down. Any extra cards are added to this. After everyone has tabled their cards, all face-down cards are turned face-up. In the initiative order, i.e. Devil with lowest political value (number inside ) in its home realm going first, each Devil handles and discards all event cards it has just revealed. Events are handled from left to right, and all handled events are then discarded to appropriate discard pile, unless the card states otherwise. When targets for events are determined, always try to find an eligible target unless specifically stated in the card otherwise. Thus, if an event targets a Devil with tabled Common Fiends and most hand cards, find the Devils with Common Fiends and among those the one with the most hand cards. Find out which Devil has most dots of each type ( ) in tabled cards, in that order. Apply any modifiers so that maximum number of dots are created. The one with most wons supremacy in corresponding dominion. If tied, the Devil with higher value for that dominion on its home realm. For each supremacy gained, a Devil gains permanent Victory Point (VP), which is marked with some kind of marker. In addition to VP, the Devil who won VP from the (Military dominion) can then swap its home realm with any single other Devil or with any home realm in the middle of the gaming board. The game then immediately ends if any Devil reaches 6 or more VP in total. Each Devil is allowed to carry to next turn up to 6 hand cards and 3 tabled horde and/or artifact support cards. Any exceed cards must be discarded. A Devil cannot discard any extra cards unless it has some special power to do it. Thus a Devil with 2 hordes and artifacts on table and 3 hand cards must discard one horde or artifact from the table but cannot discard more. The discard is done simultaneously - the easiest way is to handle it so that every Devils puts their normal hand cards aside, takes their tabled cards into hand and then picks the 3 cards to keep. Some cards have effect at the start of the discard phase. If there is several such a cards, the controller chooses the order - the Devil order is determined normally by the initiative order. The new Overlord gains +1 VP for that position. The winner of the game is the Devil with most VP in total, i.e. the Overlord in basic game. Owner: the original owner of specific card, i.e. the Devil whose name, number, or symbol is on it. Owner is used to determine where card is returned or put after being played or discarded, and has no effect on who can play it. Other Devil: not the Devil playing the card effect. Initiative order: determined by the Political value ( ) of the home realms, the lowest value going first. Discard piles: face-up, but do not investigate unless need to. Deck shuffle: unless noted otherwise, when a deck is shuffled, its discard pile is shuffled into it. Hand cards: unless noted otherwise, hand cards have no type or rules. Known Information: Hand size (number of cards in hand) is common knowledge and each Devil must reveal it if asked. Number of Oaths is not. Size of decks or cards in the discard pile, apart from the top one, is kept hidden. Alliances can be used with three or more players. With alliance rules, Devils can combine their forces and together win supremacies. The rules are simple and should be always used. If alliance rules are used, each Devil gets its own alliance counter when the game starts. This counter can be traded in the trading phase, except that only the owner can trade it to other Devil than the owner; other Devils can only trade alliance counters back to owner. In addition, if personal decks are used, those include cards to move alliance counters. All alliance counters are always returned to original owners in the discard phase. In phase 4, Determine Supremacy, Devils form alliances with those whose alliance counter they have. Thus, if Mammon has the alliance counter of Asmodeus, they form an alliance, regardless if Asmodeus has alliance counter of Mammon or not. Any chained alliances form one big alliance, but if all Devils are in the same alliance, it is broken and everyone fights alone. If any alliance is formed, its leader is the Devil with most alliance counters. If this is tied, the tied one with highest Political value ( ) in its home realm. The leader of an alliance is the only Devil in that alliance who can swap its home realm if the alliance wins the Military ( ) supremacy, but it cannot swap its home realm with anyone from the same alliance. Power dots for each dominion in alliance are sum of final dots of each Devil, but deduct two (2) dots for each dominion for each Devil after the first. Asmodeus has , , and . If he has alliance with Baalzebub with , , and , together they would have , , and . If Mammon with , , and would also be part of the alliance, the result would be , , and . If alliance is tied with some other force, use the lowest realm value found from the alliance. If alliance wins any VP, everyone on it gains the full amount - VP is not divided between the alliance members. Oaths are long time ago made promises of redistribution of power. These Oaths are reflected with special Oath cards and they add new power options and secret scoring to the game. Two-player game cannot use Oaths. Alliances should be used. When the game starts, take 6 Oaths of each Devil partaking. Oaths of the non-partaking Devils are not used. Each Devil gets 4 of its own and 2 random Oaths. All Oaths are kept face-down on the table or in players' hand. Oaths can be traded freely in the trading phase. When the game ends, the new Overlord is declared as in the standard game. However, when determining the final score for each Devil, each Oath is worth as many VP as the corresponding Devil has VP - except for the own ones, which are worth half that amount. Game ends with Asmodeus having 5 VP, Belial 7 VP and Lilith 4 VP. Belial becomes the new Overlord with 8 VP (+1 for becoming the Overlord). Now each Oath of Asmodeus is worth 5 VP (but only 2.5 for Asmodeus), each Oath of Belial is 8 VP (but only 4 for Belial) and each Oath of Lilith is 4 VP (but only 2 for Lilith). If still tied, the Overlord wins, regardless of its VP! Each Devil has its own special 9 card deck that represents the special powers and tactics of that Devil. These cards are like normal resource cards, they just come from a different deck, and thus can be traded etc. normally. If alliance rules are not used, remove the single 'alliance' card from each personal deck. At the start of the game, each Devil takes its own personal cards, shuffles them together and forms its own personal deck. Any discarded personal cards are put to their own discard pile next to original owner's personal deck. That discard pile is not shuffled to form a new personal deck if the personal deck runs out - once it is depleted, the Devil can only draw from the main deck, except that.. If no Devil has cards left in their personal decks at the end of the draw phase, all personal discard piles are shuffled to form new personal decks. Asmodeus 60 Arch-Fiend of the Devilkin You or your side wins any tied supremacy in , regardless of any home realms. Mephistopheles 50 Lord of the Whispered Promises You or your side wins any tied supremacy in , regardless of any home realms. Belial 20 Lord of Pain and Suffering You or your side wins any tied supremacy in , regardless of any home realms. (1) This is optional and normally means that Baalzebub then tables 4 cards, not 3. (2) Thus Mammon draws 4 cards in the first game turn. (3) Lilith can empty her hand from non-rituals at the end of each game turn if so desires. Home Realms are used as the final tie-breaker in supremacy and determine the order of handling the events. The main deck consist of 60 cards and is used by every Devil. Vortex of Magic x2 92 ritual event Each Devil not on your side discards a tabled Sanctuary, or if does not have, total of 2 random tabled artifacts and rituals. (1) The first Tormented Ones is not specified, it is just one of your tabled ones, and if you lost it, some other of them is now classified as the first one. (2) This means that your tabled cards cannot be selected as target for Bury, for example. Choose next Devil. Certain events overrule Sanctuary and their text takes precedence. (3) Devils without hordes or with Sanctuary do not lose anything. (4) So you decide your discard after you have seen each others choice. (5) Minimum is just that: regardless of any other cards you have at least this 4 dots, but other cards do not add to this value. (6) You can animate hordes discarded from any Devil. (7) So in normal case you can table 4 cards in the reinforcements phase, but one of them must be a ritual. (8) While your side wins any ties based on home realms, Devil powers are still final tie-breakers. Each personal deck is 9 cards, including one Alliance card which is not used in two-player game. Asmodeus, Arch-Fiend of the Devilkin is ancient and wise Devil who relies in straight approach of crushing his enemies. Martial Law 67 support Each Devil adds its total to its total. Ancient Allegiance 69 alliance event Devil not on your side with its own alliance counter and highest value on its home realm gives its alliance counter to you. (1) This can be read as your maximum and minimum power is five. (2) Thus if all three are on table, they each have one dot of each dominion. If Bury hits the Nether Fiend providing red dot, the others cannot be affected with same Bury. Likewise, Steal Power can take any of them if the one providing blue dot is on the table. (3) You keep this until you win VP. Mephistopheles, Lord of Whispered Promises, calls for Souls and hordes of other Devils. His speciality are hordes that can be discarded in the trading phase. Furnace of Souls 55 ritual support * This card has for each you have. To determine supremacy, you have no . Faithful Followers 51 support In the supremacy phase, if you do not win VP from , remove this card from the game. Otherwise shuffle it to your personal deck. Primary Mission 54 support Each Devil adds its total to its total. Loophole 59 alliance event All alliance counters are returned to owners. (1) You do not discard this from hand but from table, i.e. you must table it in previous turn first. (2) Yes, this can be you, when there is no effect. Baalzebub, Lord of Flies and Deception, has a deck of confusion and stealing. Insect Fiends 41 horde support At the start of the discard phase, choose and discard a hand card. Realm of Flies 47 ritual support In the discard phase, you can keep this to the next turn. If you do, any other cards you keep are kept face-down until other cards are revealed in the next reinforcements phase or until you trade them or lose this card. Recycle 43 support At the start of the discard phase, put this aside. At the end of the discard phase, discard this and take to your hand any single card discarded by any Devil in this discard phase. Cloud of Flies 48 event Each Devil discards a random tabled horde. You then table a random one of the discarded hordes. Thief in the Night 45 event Gain a random tabled artifact from the Devil with most . If tied, use lowest value in home realm. Quarrel 49 alliance support In every alliance, each Devil after the first one reduces power in each dominion by 4, not 2. (3) If any Devil already has same number or less cards than you have, it ignores the effect. Handle hordes and hand cards independently of each other - if Baalzebub has 2 hand cards, everyone discards to 2 hand cards and so on. Mammon, Lord of Greed, is the card master. Looter Fiends 31 horde support In the draw phase, draw an extra card. Forced Agreement 38 event Only has effect if you have at least 2 hand cards. Find the Devil with least hand cards, or if tied, with highest value in home realm. Give that Devil 2 hand cards and gain a random tabled horde or artifact from it. Bought Alliance 39 alliance event Devil with its own alliance counter and not on your side with fewest hand cards, or if tied, highest value in home realm gives its alliance counter to you. Give that Devil a hand card of your choice. (1) Yes, you can take artifacts discarded from other Devils. This saved artifact is counted as any normally tabled card in the discard phase. (2) Handing cards away is not classified as discard, but if you cause discard of your own support cards, you can still draw cards. (4) Theoretically you can gain control of all Warriors of Darkness on table. (5) Any contributed items are handled face-down. If any Devil does not have enough items, it gives and gets back reduced number of items. (6) You still have to discard to 6 hand cards in the discard phase. Belial, Lord of Pain and Suffering, has a deck with cards to handle Tormented Ones and to torture other Devils. Infernal Slaver 27 horde support At the start of the reinforcements phase, you have 6 seconds to search the main deck and its discard pile for one Tormented Ones and table it. Shuffle the main deck afterwards. Ritual of Torment 23 ritual event In the initiative order, each Devil not on your side puts top 3 cards of its personal deck into discard pile. That Devil can prevent that by discarding its entire hand. If any Tormented Ones are discarded, table one of them. Tortured Obedience 29 alliance event Devil not on your side with its own alliance counter and lowest value in home realm must give its alliance counter to you and discard all but one hand card of its choice. (1) Effectually makes all your Tormented Ones to have full dots. (2) This is Tormented Ones in every way. (3) Yes, this includes you. All artifacts must be revealed as missing ones must be on the table. If several Devils have artifacts in hand, they choose the discard decision in the initiative order. (4) Yes, this includes you. Lilith, Sorceress of Hell and Mother of Demons, has a wide selection of powerful rituals and hordes supporting them. Her speciality are effects done at the start of the discard phase. Diabolic Seduction 19 alliance event Only has effect if you have your own alliance counter. Give it to Devil not on your side with alliance counters and lowest value in its home realm. (1) Handled ritual events and rituals destroyed by Vortex of Magic are both eligible. If you do not take the card to your hand at the start of the discard phase, discard it. (2) Yes, you can take it from other Devil. (3) The Ritual Advisor must be already on the table to be discarded, i.e. you must have tabled it in previous turn. It is possible that there is no rituals in the 12 cards, that is your loss then but you still get to table 4 cards in the reinforcements phase. (5) Yes, this includes you. (6) All events still on table are immediately discarded. Lords of Hell © Kalle Marjola 2000-2007.